The diverse climatic conditions, high-grade and fertile soil, and potential access to water resources have provided favorable platform for the extensive cultivation of different crops in Iran and subsequently proper conditions for the activity of a variety of plant viruses, including members of the genus Begomovirus. 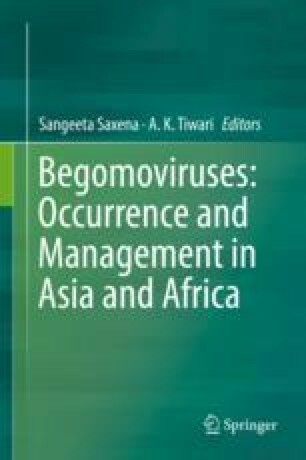 Several mono- and bipartite begomoviruses have been reported to infect various crops in the country; some of them seem to be new species/strains. Widespread occurrence and high economic impacts of a number of Begomovirus species across the country have been well documented. In recent years, reports of the natural occurrence of these viruses from new regions/hosts in Iran have been significantly increased. This is mainly because of the suitable climate conditions (especially in the southern areas), presence of various host plants, high activity of whitefly vectors in climatically different regions, and emergence of pesticide-resistant whitefly populations. Moreover, neighboring with some countries where a broad range of genetically variable begomoviruses exist and the presence of common hosts to different begomoviruses, that favor mixed infections and recombination events, have made Iran as a center for diversification of these viruses. These aspects, coupled with global warming, which possibly provides appropriate environmental conditions for both viruses and vectors in other regions of the country, show the serious and continuous threats of begomoviruses in the mid-Eurasia of Iran and indicate the necessity to develop new strategies for their efficient control. The authors wish to thank Dr. M. Digiaro (Istituto Agronomico Mediterraneo, Italy) for kindly reading the text. Providing the book chapter was supported by a grant from the Iranian Group for the Promotion of Science, IGPS, No. 95001001.